I captured these moments when I visited Petuguran Dam in my husband’s home town. During the Eid ul-fitr vacation times, around the area, there are held some games spots. One of them is this ball playing game. We call it ‘mandi bola’ or ‘having a bath with ball’ game. A sweet little girl attracted my attention with her funny acts. Children looked so happy with the balls! My kids love this too. 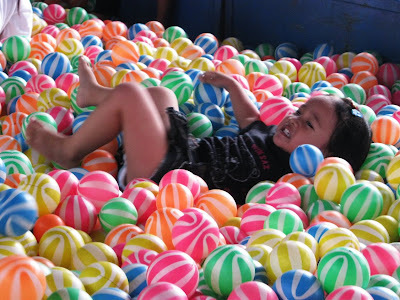 I used to take them to a place called Fun Factory where they can play like this. Cute photos. wow! lots and lots of balls....:) oh my! funny because in the Philippines we call it "bola" too....:) glad to know! mine is up as well! kids these days, they got so much. 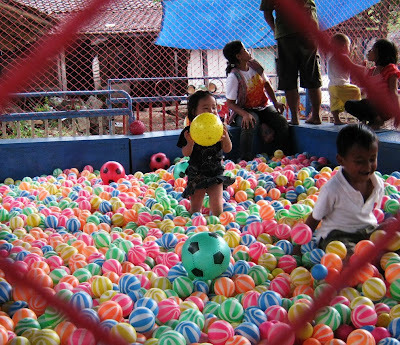 The kids sure to love playing with these balls!